Sir Robert Grant was a politician, barrister, Director of the East India Company and Governor of Bombay, who took a significant interest in pursuing Jewish emancipation. The majority of his hymns were written between 1806 and 1815, when they were published in the Christian Observer. This imaginative, spiritual reflection on the beginning of Psalm 104 is perhaps his most famous hymn, and was first published in 1833. 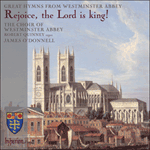 Although the tune Hanover was first published anonymously in the Supplement to the New Version of Psalms by Dr Nicholas Brady and Nahum Tate (1708), it is widely believed to be by William Croft (1678–1727), who became Organist of Westminster Abbey a year after its publication. The descant is by Alan Gray (1855–1935) who was Director of Music at Trinity College, Cambridge, for over thirty years at the beginning of the twentieth century.